in good timefor you to remain alive. Cardiac deaths reach their peak during December and January, the experts say, and it's important for anyone to know what to do in the event of either experiencing a heart attack or witnessing one. Below is a post that initially appeared at The Biology Files, but given the season, we think it's important information to have front and center. Last spring, a man who had come to our house to deliver a box for storage/moving died of a either a heart attack or sudden cardiac arrest in the street in front of our home. The story of what happened with him and our response is available here. What I'd like to blog here is simply a health warning of sorts, an alert for anyone who reads this in the hope that maybe that one person can avoid an early, sudden death like this one. I'd infer from his physical condition that he likely also had another risk factor, a sedentary lifestyle. Even though his work had been for many years delivering these boxes--with a smile and a lovely friendliness, I add--it was not necessarily physically demanding work, as it primarily involved using a forklift to load and unload the crates. The thing is, I learned from one of his co-workers that he had come in the previous day complaining about feeling unwell in an odd, indescribable way and of unusual fatigue. I wish--I'm sure everyone who knew him wishes--that he'd taken that as a sign to get checked out. With his risk factors, it would have been a reasonable thing to have done. Complicating his situation was the fact that he had asthma. The symptoms of an asthma attack and of a heart attack can seem very similar and difficult to tease apart. The key distinction seems to be that asthma doesn't involve a feeling of chest pressure, and a heart attack does not respond to the use of inhaled asthma medication. Add to that that his asthma may also have been a risk factor for heart disease, and you've got someone who had four or five risk factors for a heart attack. He was certainly a good candidate for a full health workup had he presented the previous day with his symptoms of "not feeling quite right" and "fatigue" and his risk factors. His death was a terrible loss for his family. It's also terrible to think that recognition of some of the risk factors compounded by what may have been some warning signs went unheeded and ended in this loss. These issues aren't close to my heart only because this man died at our home. My grandfather also died at a relatively young age and without warning, lying in bed, reading a news magazine. He also had a number of risk factors for heart disease, including a family history, smoking, and other lifestyle factors. His visits to the doctor were few and far between, and he likely had never had a workup for heart disease. The night before he died in his bed, he'd complained about not feeling quite right, an upset feeling in his stomach. And then he...just died. Everyone is going to die. Obviously, we can't get away from that. But an awareness of risk factors and of lifestyle factors you can modify can mean the difference between dying suddenly and all too young or dying in your sleep at a grand old age with your life in order and some expectation that Death is on its way. Because this is Double X Science, we note that heart attack symptoms in women can differ from those in men. There is some overlap, including feeling strangely fatigued, something like indigestion, anxiety, dizziness, shortness of breath, and weakness. Women may also experience sleep disturbance, arm weakness, and indigestion more than men do, while not showing what have been considered the classic chest-gripping signs of a heart attack. Another form of sudden death related to heart problems can be sudden cardiac arrest. We were told that the man who died did so of a heart attack, but I'm not sure if that was a term arising from a layperson's understanding or because that was the final medical determination. 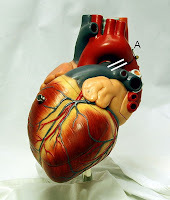 A sudden cardiac arrest results from electrical misfiring in the heart muscle. It differs from a heart attack, which results from blockage of blood flow to the heart so that the heart tissue dies. Either can cause sudden death. The fact that he may have been having some sort of prodrome the previous day could have indicated either. If he was fibrillating, he also would have felt "odd" and "fatigued." Some things about what happened make me think that the man who died may have experienced sudden cardiac arrest. He was unresponsive and not breathing when we found him, and after the EMTs arrived, they continued the CPR we'd begun and tried de-fib on him three times. Given these factors, it sounds to me as though he'd had sudden cardiac arrest, rather than a heart attack. The risk factors for the two are similar. And the outcome in this case, regardless, was death. Finally, there is the matter of what a bystander can do who finds themselves in our position. Call 911. Push hard and fast. Someone had already called 911, so we immediately began chest compressions. No mouth-to-mouth is necessary. Further, the compressions really need to be deep enough. In essence, you are trying to be the heart for the victim, to imitate what the heart, a powerful, muscular pump, would be doing. So, the current response to a sudden cardiac death is pretty simple: Chest compressions only, 100 times a minute. Count them out loud as you go. It's a fast clip. Some people recommend doing it to the beat of the Bee Gees' song, Stayin' Alive, if you're familiar with that. For more information on what you can do in an emergency situation like this one, see the Red Cross guidelines (pdf). Learning these may someday help you save a life, in any season. Here's a video of comedian Ken Jeong demonstrating the hands-only Stayin' Alive technique. The basics: Call 911. Push hard and fast.